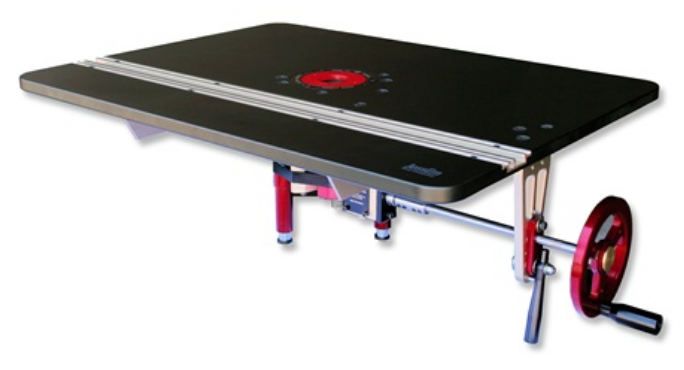 Before JessEm invented its first router lift in 1999, adjusting the height of a table-mounted router was no easy task. That first lift solved a problem for woodworkers everywhere, and earned JessEm recognition for its innovative and high-quality woodworking tools. Today, JessEm continues to set the standard for router lifts, tables, stands, fences, accessories and more, manufacturing many of its products at its facility in Oro-Medonte, Ontario. Shop JessEm products now or keep reading to learn about a few of JessEm’s Canadian-made tools available online or at a KMS Tools location near you. Both the Mast-R-Lift II and Rout-R-Lift II feature smooth-turning double-sealed ball bearing spindles, hydraulic-pressed shafts for extra rigidity and low-profile designs that allow for above-the-table bit changes. With a hard-anodized top plate and smooth ball-bearing operation, the Mast-R-Lift II is JessEm's top-of-the-line router lift. 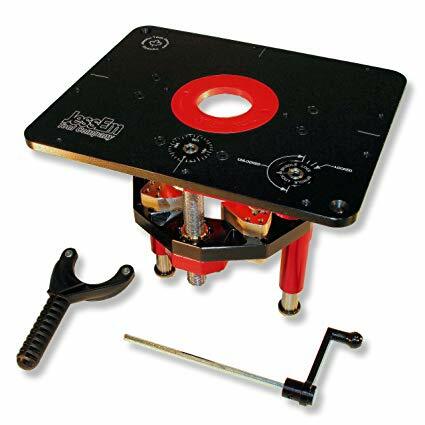 The Rout-R-Lift II includes a sleek phenolic top plate and allows above-the-table bit changes. While the Rout-R-Lift II comes with a sleek 3/8″ phenolic top plate, the Mast-R-Lift II has a gorgeous hard-anodized aluminum top plate that delivers the utmost in abrasion resistance and service life. CNC machined at JessEm’s Ontario manufacturing plan, these router lifts feature anodized aluminum components for appearance, corrosion resistance and durability. Before you choose a router lift, check for compatibility with your fixed-base router. The Mast-R-Lift II fits 18 of the most popular fixed-base routers, out of the box. 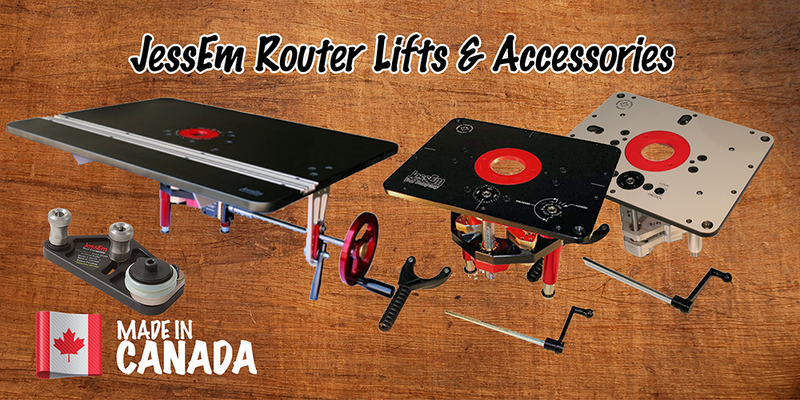 The Rout-R-Lift II is available in different versions to fit a variety of routers. 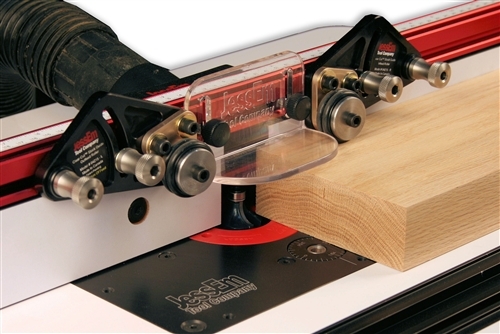 For Canadian-made router tables and table tops, JessEm has a couple of options. The Mast-R-Lift Excel II is an all-in-one lift and table top. It uses the same carriage as the Mast-R-Lift II, so it’s compatible with almost any fixed-base router. With 11 double-sealed bearings (two on the lift shafts, six on the height adjustment mechanism and three on the cam lock), the Mast-R-Lift Excel II is one of the smoothest router tables available. The Mast-R-Lift Excel II is a high-quality, smooth-operating router lift built into a solid phenolic router table top. It uses the same carriage as the Mast-R-Lift II and also fits most fixed-base routers out of the box. Its table top is solid phenolic, with a built-in dust fitting and an extruded aluminum T-slot track and mitre slot. Available on its own or in a complete router table assembly, the Mast-R-Top phenolic table top provides a smooth, stable worksurface, complete with a built-in T-slot and mitre slot. 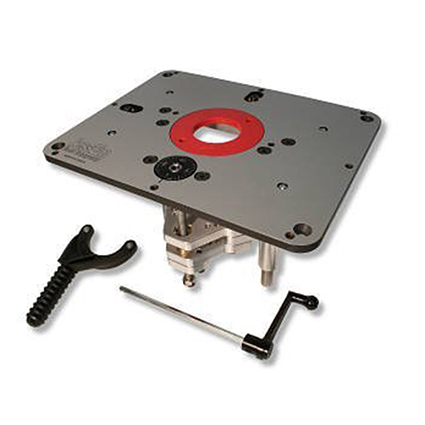 Mast-R-Top also features a CNC-machined cutout that fits any JessEm router lift. Along with its router lifts and table tops, JessEm also manufactures a variety of handy router accessories including Clear-Cut Stock Guides. These guides hold stock safely against your fence and router table top, like a featherboard. Yet unlike a featherboard, Clear-Cut Stock Guides steer your stock toward the fence while you feed. JessEm Clear-Cut Stock Guides effectively steer your stock toward the fence with unique guide rollers mounted on 5 degree angles. The guides are angled 5 degrees, and their urethane rollers hold the workpiece securely and pull it toward the fence. Even when routing wide boards or large panels, Clear-Cut Stock Guides can help you better control your stock. The resulting cuts are smoother, safer and more accurate. The best part? They’re made in Canada! A Canadian-owned family business since 1981, KMS Tools aims to deliver the best value guaranteed! This includes selling Canadian-made tools whenever possible. 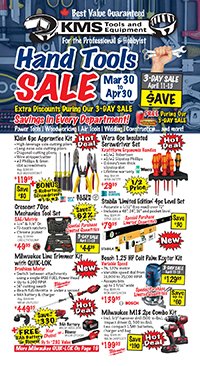 Keep an eye on the KMS Tools flyer to discover new tools and amazing sales, and look for the Made in Canada logo. This entry was posted in Archives, Made in Canada, Woodworking and tagged main_page, Woodworking by Your Friends in the Tool Business. Bookmark the permalink. Next → Next post: Arbortech Ball Gouge, Turbo Plane and More!